The Ten Out Of Tenn artist collective–comprised of 10 independent musicians–will compile the past decade onto an album release, slated for March 17 with Kirsten Dabbs‘ Ready Set Records. 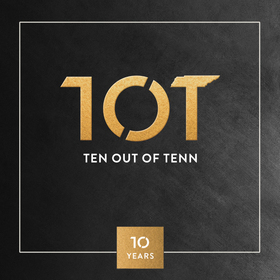 Two disks, Ten Out Of Tenn: 10 Years will include musicians as Joy Williams, Sarah Siskind, Kate York, Jeremy Lister, Mikky Ekko and more. The release will coincide with a special anniversary show at the Ryman Auditorium on April 24. Tickets are on sale, to include Kyle Andrews, Andrew Belle, Butterfly Boucher, Trent Dabbs, Andy Davis, Gabe Dixon, Katie Herzig, Tyler James, Matthew Perryman Jones, Lister, Erin McCarley, Paper Route, K.S. Rhoads, Siskind, Amy Stroup and more to be announced. Ten Out Of Tenn has had over 500 TV/Film placements.